The #1 reason for corporate governance failures is that Boards and Directors remain unclear on their role. As a result, insufficient effort goes into the oversight function that is fundamental to corporate governance (governance = oversight). Clarifying that oversight is the primary role of a governance Board helps all Directors begin to understand their role better. Identifying the three key areas of governance oversight focuses Directors better on their oversight role. The three areas of oversight are risk, strategy and performance management of the CEO. Including oversight of environmental (external) risks and operations (internal) risks, not just legal and financial risks is an important expansion of the risks most Boards look at. Many governance failures result from environmental and operating risks that were never considered. Boards should evaluate strategy on the basis of how well risks are being mitigated and how well the organization’s mission is being achieved. Many Boards and Director fail to recognize these links between strategy and corporate governance. CEO’s are responsible for executing the Board’s approved strategy. Boards get confused on this and fail to assess the CEO in the context of risk mitigation and mission accomplishment. In summary, the key to avoiding corporate governance failure is to clarify the Board’s oversight responsibilities and simplify its efforts on risk, strategy and CEO performance management. 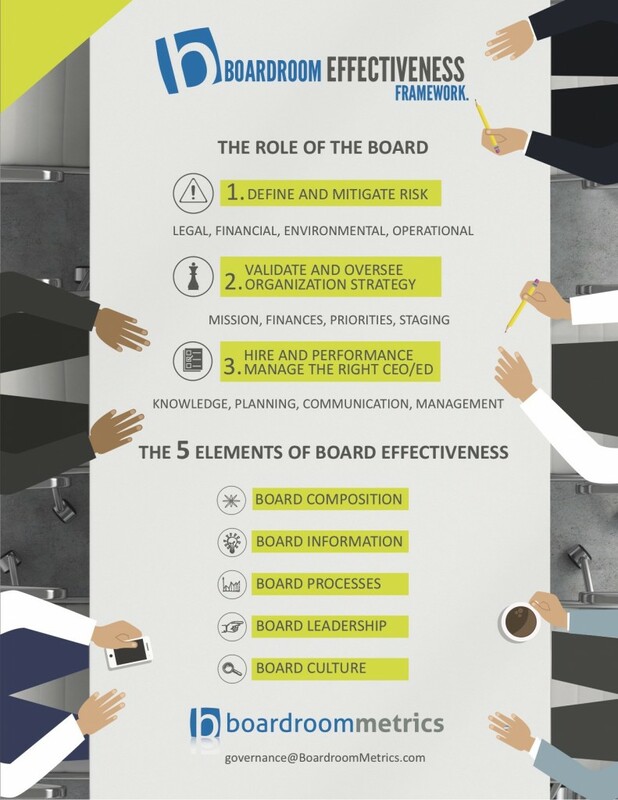 This infographic captures the focused Board role and execution that helps organizations avoid corporate governance failure. There are only three elements of corporate governance: 1) identify and mitigate risk 2) validate and oversee execution of strategy, and 3) performance management of the CEO. What makes this definition effective is the onus it puts on the Board to execute these elements – and only these elements – in their governance discussions. Sound too simple? Try this. Out of the limited amount of time your Board has available to provide strong corporate governance, how much time is going towards the role outlined here? Risk comes in four flavours. Legal, financial, environmental (outside the organization) and operational (inside the organization). Most Boards are reasonably well informed on the legal and financial risks. Not so much on the environmental and operational risk. If RIM’s Board managed to miss the risk posed by the iPhone and VW’s Board missed the risk posed by faked emissions results, what risks might your Board be missing? Strategy is what separates sustainable leaders from everyone else. And it starts with mission. Quick, what’s the mission of your organization? You can’t govern effectively if you don’t know why you’re in business. Once you understand that, everything else – the strategies, tactics, even the org chart – fall into place. Hiring and performance managing the CEO. Most Boards understand their role to hire the right CEO. An increasing number of Boards understand that performance management of the CEO is also part of their role. CEO’s are generally the only employee reporting to the Board. We expect every other employee to be well managed. The same must apply to the CEO. Board Composition: Directors with the skills and expertise to understand risk, strategy and performance of the CEO. If this sounds like a no-brainer, it’s not. For example, despite what almost everyone thinks about their strategy skills, very few people are good at corporate strategy. Do you have some good corporate strategists on your Board? What about a Director who understands technology risk? Board Information: Information that informs the Board on risk, strategy and performance of the CEO. Think of the information your Board receives. How well does it help you understand the environmental and operational risks the organization is facing? Is it framed that way or do you have to interpret it? What more is required for you to be better informed? Board Processes: Processes like Board meeting agendas help keep the Board focused on risk, strategy and performance of the CEO. If you look at your last Board meeting agenda, how much time was dedicated to the three elements of the Board’s role? If each of the agenda items had been reframed in the context of risk, strategy or CEO performance what would have disappeared from the agenda? What different questions would you have asked? Board Leadership: It’s the Board leaders (Chairs and Committee Chairs) who ultimately determine what the Board focuses on. Some take their direction from the CEO – a basic governance mistake. Others are respected, experienced leaders who understand the Board’s role and the relationship with the CEO. As a Board Chair, what kind of focus are you leading your Board towards? Board Culture: Studies show that organizations with Boards who work well together and with the CEO perform better. However, working well together doesn’t mean always agreeing on everything. Focus your Board and CEO on risk and strategy. How well is it working together on these priorities? What’s missing?